Bamiyan will be forever known for the destruction by the Taliban of the magnificent standing Buddhas in 2001, it shocked the world. 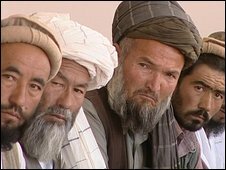 But Bamiyan wonders why - now that the Taliban has left - the world seems to have forgotten them. "Sometimes I've had to use a very strong voice - don't make Bamiyan the naughty boy," Governor Habiba Sorabi explained, outlining the frustrating years trying to raise money from donors for what has been one of Afghanistan's most peaceful provinces. At times, she has been to known to be more blunt, asking "Do we need Taliban to get your attention?" It is a refrain you hear often in Bamiyan. Habiba Sorabi made history in 2005 when she was appointed Afghanistan's first and only female governor, though it has been harder than she expected to put Bamiyan back on the map. But now she has some allies. UN Special Representative Kai Eide has been warning donors "if we ignore places that are stable, we will pay a price for it". He accepted the logic for major donors to send aid to unstable provinces where they also deploy troops. "But the end result is we will need foreign troops where we do not have troops today, and we simply don't have more troops." 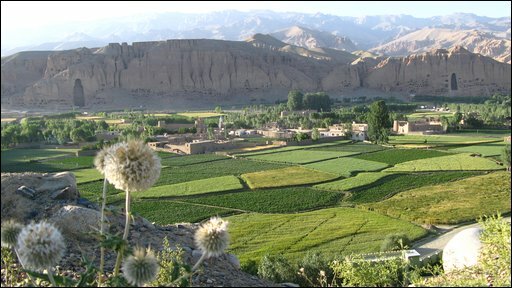 Peaceful Bamiyan is peopled largely by ethnic Hazaras who have suffered greatly in Afghanistan's quarter-century of war. It sits in the central highlands, bordering more volatile provinces. Violence has already started to spill over. Local leaders from eastern Bamiyan recently converged on the governor's office for the first meeting, or jirga, on security. The turbaned bearded men, who lined a long table in rows two or three deep, even had a reluctant good word about security during Taliban rule. "Ninety-five per cent of us blame the Taliban regime. But believe me, if anyone was travelling from Bamiyan to Kabul back then, no one would have bothered them. Because the Taliban would have chopped off their hands!" US and New Zealand military commanders attending that jirga listened intently, the message has been getting through. "We're catching up, making up for lost time," conceded the head of New Zealand Forces, Group Captain Greg Elliott. In recent months New Zealand, which heads the Bamiyan command, has started using armoured hummer vehicles after a sharp rise in attacks. Shortly after our visit, Mullah Borhan, the Taliban's self-appointed shadow governor of Bamiyan was arrested. US commanders are also wielding their emergency funds to start making a difference. The timing may have been coincidental, but the day after the jirga, two new road projects were inaugurated with bright shiny ribbons and big trays of Afghan sweets. It was a flash of colour and hope on dirt tracks in what seemed the proverbial middle of nowhere. We hitched a ride to reach the spot on US military helicopters. Governor Sorabi declared it "a dream come true" to connect the people of Bamiyan to Kabul with a paved road. Once that link is finished, it could cut the drive to Kabul from nine hours to three. But good intentions do not impress the people of Bamiyan anymore. Another road connecting the province to the capital was inaugurated three times, but still has not been built. "Roads are part of winning the war," agreed Colonel Scott Spellmon, commander of the US Task Force Warrior in central Afghanistan, as the odd vehicle lurched by, kicking up clouds of fine brown dust. "They're the backbone of economic development." Asphalt matters to absolutely everyone - from potato farmers who cannot get crops to markets, to local musicians who blend a mournful lament about the destroyed Buddhas with poetic protest about all the dust on the roads. Only a few kilometres are paved across all of Bamiyan. You eat a lot of dust driving a few hours out of Bamiyan city on what passes for a road, to reach Afghanistan's first national park at Band-I-Amir. But the bone shaking ride is worth it. 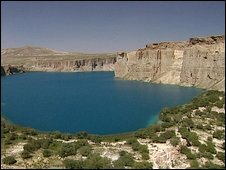 The clear blue lakes cradled in the mountainous craters of the Hindu Kush are breathtaking. 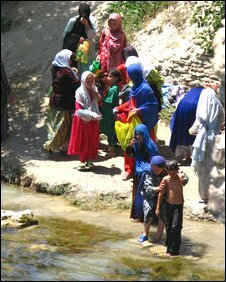 Afghans are turning up in droves to picnic with their families along the lakes, and to dip in the chilly, brilliant blue waters which are believed to have curative powers. On a recent visit, UN envoy Kai Eide marvelled at the magnificent vistas, and extolled the economic potential of a mineral rich area with Asia's largest iron ore reserves. A Norwegian, he even visualised Olympic ski slopes. His bodyguards did not look quite so enthusiastic as they pedalled madly behind in swan-shaped pedalos across the sapphire pools. And at a meeting with local representatives Mr Eide and Governor Sorabi listened to concerns that fourteen villages now share a clinic and that there are not enough schools for girls when they reach ninth grade. Bamiyan is but one province in a country still struggling to emerge from the legacy of a punishing war, and not even the most forgotten. But it is a reminder both of the promise Afghanistan still holds, and the promises the international community still has to keep. Watch Lyse Doucet's film in full on Newsnight on Tuesday 18 August 2009 at 10.30pm on BBC Two.